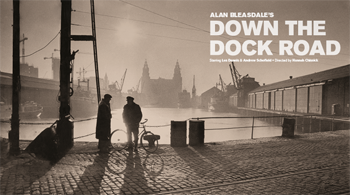 If I was a Liverpool Docker, I would be first in the queue to give Alan Bleasdale a close up of my Docker’s hook. What a clichéd and caricatured depiction of a group of scouse dockworkers this play is. I can’t understand why it received rave reviews on its first outing in the 1970’s or why it has been revived today, possibly because of sentimental Corbyn supporters who think looking backwards to a time when labour was more unionised is the way forward? I thought it was an undignified portrayal of a group of workers, depicting them as lazy, thieving and backstabbing and it exploited every caricature of the robbing, joking scouser I have ever heard or seen. It wasn’t helped by the stage set which was static, boring, unimaginative, with little use of light or sound to create atmosphere in what was just a pile of empty boxes and a group of men in jeans. Most of the jokes were so old and so bad that they weren’t even funny the first time around, or the second or third..., I’ve heard better from a cheap Christmas cracker. This is meant to be a nostalgic return to the colourful characters who used to work in Liverpool’s docks and the tricks and scams they got up to. It is set in 1976 on “Grandad’s” last day at work as a docker after 40 year’s hard labour and he wants to see the day out quietly, but surrounded by “the lads” including Mickey “the comedian”, Dobo the “Croxteth Casanova”, “Wonderboy” and “Mad McKenna” the bullying union rep., a stolen watch and a case of whiskey. The day becomes eventful. While the Dockers make plans to nick some of the cargo, under the leadership of the embittered McKenna, the boss blackmails one of the men who is claiming benefits while “working on the side” to set McKenna up so he can catch him with stolen goods and sack him, because he is a “troublecauser” and to put a stop to what the union argue is down to “breakages”, goods “lost in transit” of “fit-ups” by the bosses. While Grandad looks on, the “(in)security” turns a blind eye and “the lads” chat and banter revealing their different lives outside the workplace neatly encapsulated in the witty and sometimes cruel nicknames they ascribe to each other. For many years, real Dockers worked hard in appalling, dehumanising conditions for low pay. The casual labour system meant they had to stand on the dockside and wait to be picked for a day’s work, a system that pitted one hungry Docker against many more, which was far worse than any zero hours contract some of today’s whingeing no-action youngsters complain about. It was well known in Liverpool that some Dockers pilfered the cargo to supplement their meagre income, and this “perk of the job” is good for a few laughs, or what is known as the humour of despair, but after watching this overlong and dialogue heavy production of a small cast of men shifting boxes around, you are left with the impression that this was all the Dockers thought about and that they were nothing but lazy, conniving thieves, and because of this they only had themselves to blame when the docks were mechanised. Instead of a bit of light-hearted realism from down the Dock Road, and a more uplifting snap of the life of the working class at work, we get a one-sided discourse that depicts the scouse Docker as cheeky, lazy, and backstabbing, full of shite and dreams. All in front of a Liverpool audience, who in my experience are usually more than ready to laugh at themselves, but who for the most part were silenced by the terrible jokes, and possibly because some of them had dock working relatives who were wrecked and stunted after long shifts on low wages, who came home with empty pockets and broken bodies and troubled minds, not an illicit bottle of whiskey or a tin or two of knocked off salmon. Liverpool Dockers who fought one of the longest and most tenacious battles in working class history, betrayed by their official union, and laughed at on the stage of the Royal Court Theatre, in the vicinity of the mechanised dockyards, sent up as thieving no-hope no-marks reliant on fading dreams; scallies in the local parlance. Bleasdale has previously been proclaimed as a working class writer, and I have enjoyed some of his work and have respect for working class theatre, especially when it discusses, advances and enables cooperation and resistance to employers who want a cheap, divided and productive workforce, and when it produces a good old belly laugh as ordinary folk do only too well when sending themselves up. What I don’t find as enjoyable is drama that depicts most of us as scheming, dishonest and deluded layabouts. But credit where it is due and flat caps off to the cast who were hard working, energetic and had plenty to say. It’s just a pity most were sorry and self-deprecating instead of funny and inspiring. Writing about the workplace isn’t easy, as most work and the lives of those in it, is boring, so making it truthful, funny and interesting is an art that few master. But we really should stop reminiscing about a mostly white, macho male, unionised industrial labour force as this is no longer a true reflection of modern working life. While people’s aspirations remain unfulfilled we ought to be creating a vision for the future instead of despairing about the past. We can leave that to the Corbynistas.